Organic whole Kalamata olives from ancient groves surrounding the city of Kalamata on the south coast of Greece. The variety is exclusive to the region: aubergine coloured and almond shaped, with a succulent texture and rich, fruity flavour. The Real Olive Company harvest the fruits by hand, and preserve them in top quality cold-pressed organic oil. A very moreish savoury nibble with a chilled glass of wine and some nutty, crumbly cheese – or use to add depth to Mediterranean dishes. Keep chilled. Give a shake and cover once opened. Eat within a week of opening. The Real Olive Company was founded by Karin Andersson and Ben Flight in Bristol in 1998. Since then, they have established a network of small-scale, artisanal olive growers around the Mediterranean coast, in Greece, Italy, France, Morocco and Spain. 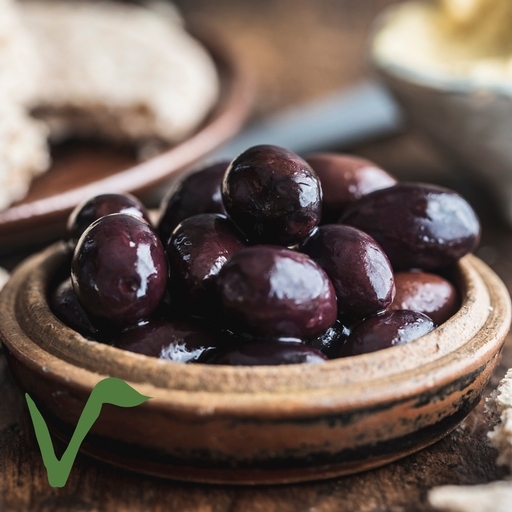 Their olives are grown as nature intended, and prepared and preserved using traditional methods with no modern artificial preservatives. Kalamata olives (88%) (olives, sea salt*, red wine vinegar, acidity regulator lactic acid*), cold-pressed sunflower oil, extra virgin olive oil. May contain traces of milk, mustard, sesame, sulphites and tree nuts.